American manned Mars expedition. Study 1957. In 1954 Ernst Stuhlinger conceived the first Mars expedition using solar-electric propulsion. Status: Study 1957. Payload: 136,000 kg (299,000 lb). Thrust: 490 N (110 lbf). Gross mass: 660,000 kg (1,450,000 lb). Unfuelled mass: 328,000 kg (723,000 lb). Specific impulse: 8,200 s. Height: 46.00 m (150.00 ft). A nuclear reactor or solar collector would drive a turbine to provide electricity that would drive an ion engine using cesium propellant. The concept was studied at the US Army Ballistic Missile Agency from 1953 to 1959 and portrayed to a wide public in Walt Disney's broadcast of 4 December 1957. In the Disney presentation, Stuhlinger imagined a ten-ship expedition that would take 200 crew to the red planet. Stuhlinger envisioned an ion engine powered by a nuclear reactor. A sodium-potassium fluid would take reactor heat and drive a turbine to produce electrical power. The heat would be dissipated in an enormous rotating flat disc of coolant tubes - a parasol. 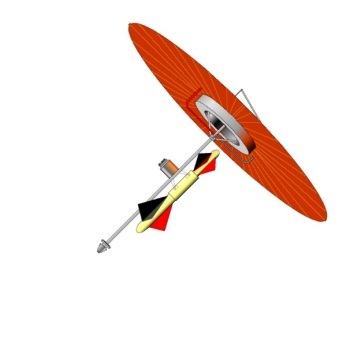 Crew quarters would be arranged in a 'donut' shape within the parasol, providing artificial gravity to the crew. The reactor would be at the other end of the parasol, where an umbrella's handle would be. At the center of gravity on the shaft in between, the cesium propellant and the Mars lander would be located. Day Zero: The spacecraft fired its engine, with an initial acceleration of 7 x 10^-5 G's (0.75 mm/sec/sec). The ship spiraled away from the earth slowly. After two hours the orbit was already 30 km farther from the earth. Day 124: The ship reached escape velocity and began to spiral way from the earth's orbit around the sun. Day 195: Midpoint of the trip to Mars. The ship turned 180 degrees and began braking its velocity. Day 276: The ship had dropped below escape velocity relative to Mars and entered Martian orbit. Day 402: The ship had entered a circular orbit 970 km over Mars and shut its engines down. Day 432: After selecting a suitable landing site, the landing crew entered the rocket-powered Mars lander and headed for the surface. The lander was equipped with stubby fins and re-entered nose-first. It then used a parachute, followed by rocket power, to land vertically on the surface. The crew would spend 412 days on the surface. Day 844: The crew rocketed from the surface in their lander and docked with the main ship in Mars orbit. Day 874: The ship cast off the lander, fired its ion engines, and began the long spiral out of Mars orbit. The return trip was the mirror image of the outgoing voyage. Day 1276: After a 3.5-year mission, the crew returned to earth. The trip was slower than that envisioned by Von Braun, but per crewmember the mass needed in low earth orbit was over eight times less, due to the much higher efficiency of the ion engines. Stuhlinger would advocate the use of ion engines again several times in the 1960's, but was overruled by those that favored use of nuclear thermal rockets, which were less efficient but allowed shorter mission times. Other advocates of nuclear electric Mars expeditions (Korolev in the Soviet Union, NASA Lewis in the United States) would later propose that the crew ascend separately in a small vehicle and rendezvous with the Mars ship only just before it was to leave earth orbit. This would eliminate the long wait in earth orbit and prolonged exposure of the crew to the earth's radiation belts (which were not discovered at the time Stuhlinger made his original proposal). It was interesting that Stuhlinger proposed a vertically landing Mars craft, as opposed to von Braun's glider. Future Mars expeditions would also proposed vertical landers, even before Mariner revealed the tenuous nature of the Martian atmosphere in 1965. Family: Mars Expeditions. Country: USA. Propellants: Electric/Cesium. Agency: NASA Huntsville. Bibliography: 49.